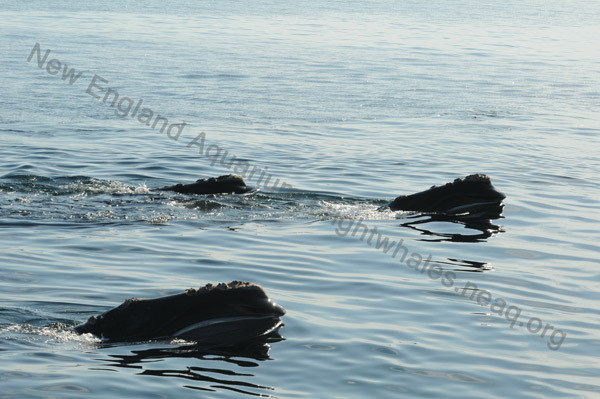 Every year, in the late winter and spring, right whales come to Cape Cod Bay to feed on rich patches of zooplankton. In some years, like this one, everything falls into place and the right kind of zooplankton (copepods) reach their peak concentration just when right whales are present in the Bay. During a recent aerial survey conducted by the Provincetown Center for Coastal Studies, there were more than 100 sightings of right whales in Cape Cod Bay--an all-time single-day record! Right whales are filter feeders. When one finds a suitably dense patch of zooplankton (copepods are the size of a grain of rice and right whales may eat 1 to 2 billion of them per day, so those patches are really densely packed! ), it opens its mouth and swims slowly back and forth through the patch, straining the copepods through the long (up to 7 feet) plates of baleen. When the patch is at the surface the whales "skim feed" so their heads are well above the water. But when the patch is a couple meters down, then the whales are feeding just below the surface and are very vulnerable to ship strikes, the leading cause of mortality. 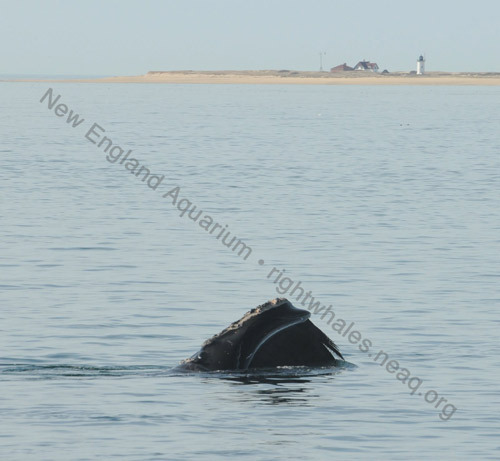 Federal law prohibits vessels from approaching within 500 yards of right whales, but the great thing about Cape Cod Bay is that right whales are frequently seen very close to shore (often within a couple hundred meters), so it's easy to do some whale watching as you walk the beach in Provincetown or Truro. That's a wonderful and very special opportunity given that right whales are the most endangered large whale and one of the rarest mammals on earth. And here they are, right in our own backyard!